If you read my article in the Press and decided to have a little gander at my blog, Welcome! In my blog you can see where I have been and what jobs I have been doing the past 5 years as I undertake my little journey to live and work in every continent of the world before I’m 30. 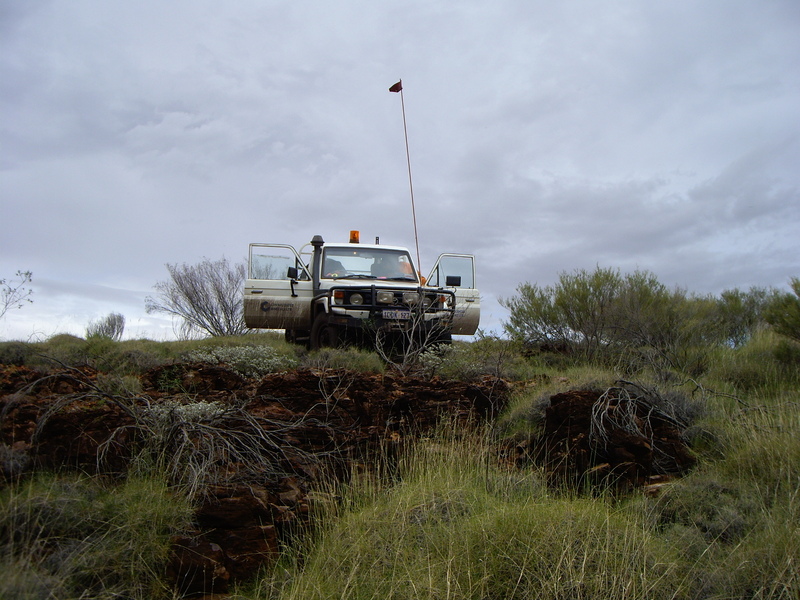 If you are more interested in my article and working in Western Australia (WA), please read on. 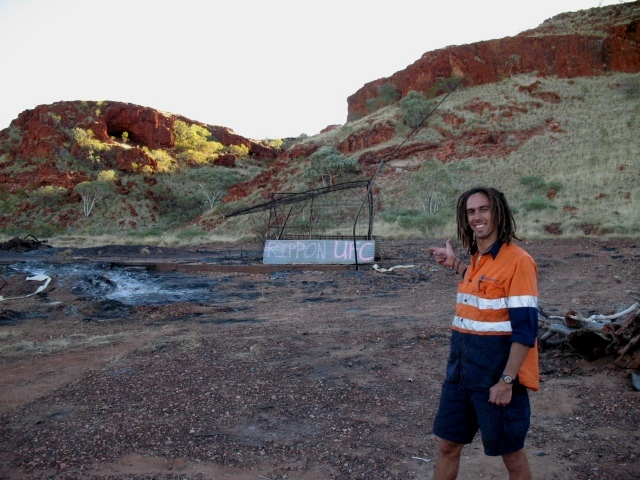 The aim of the article was to set the story straight for people who tell the tales of how easy it is to get work in the Ozzie mining industry. Also I wanted to bring potential kiwi departee’s expectations down to ground, so they are not disappointed when they arrive in OZ and find it harder to get work in the mines, accommodation etc. But please don’t abort your plans due to my article, if theres a will theres a way, and theres also plenty of people who are in the right place at the right time. Although I painted a bit of grey picture with the article to try and dampen false expectations, I love my job, I love the 2:1 (2 weeks work and 1 week off) lifestyle, I love Perth, and I’m even loving the unique landscape of the Ozzie outback. So if you want to read more about what I’m doing here in WA, click on the following links to previous posts I have written. I plan in the next 2 weeks to write a post on ‘Mining camp life’, and will get photos to show you what its like at the camp I am staying at. A day I would rather forget! Thanks for visiting and please feel free to come again. PS I will get a post up on the camp I am staying at soon. 2 weeks down, 2 weeks to go! I’m currently on a 4 week swing at work, and I am spending all my time out at the remote exploration camp where we have a caravan set up. I’m really loving the work, great bunch of guys out there and get to sleep out under the stars and enjoy the simple things in life. But I’m obviously cut off from communication, hence my slack reply to emails, so anyone that emailed me and hasn’t received a reply, that’s the reason why. 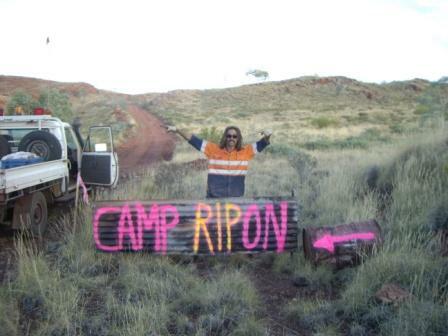 Here’s a couple of photos of me out at the remote Ripon Hills exploration camp, which has been nicknamed “Brokeback camp”, haha, enjoy. Found out the other week that I didn’t get the Antarctica job, cleaning at New Zealands Scott Base-You really have to look at yourself when you get turned down to clean toilets! hahaha. Nah, was pretty competitive, only had one opening and nearly 100 people applied. So kinda sucked for Mandy my girlfriend who had been accepted to work at the American Mcmurdo base and had to refuse. I tried everything to get “on the ice”, tried the American base (for obvious reasons didn’t get too far with that), tried getting behind the bar or cleaning at the New Zealand base, tried the Ozzie bases (was too late). But luckily I’m loving my job at the moment, its probably my favourite job since I started working the world, and the most I’ve ever been paid! So it gives me a chance to save some money, and sometime next year will take off for a couple of years and head around the world to knock some more continents off, but not until I have another crack at Antarctica. So Mr Antaractica, we shall meet again next year, don’t melt in the mean time! PS Big thumbs up to the friendly people at Antarctica New Zealand and the associated people I bugged. Overseas customer service people could learn a lot from them, especially those people in American and Canadian immigration, oh and also the Canadian Tax dept. They were all so very helpful, especially considering I had nothing to offer them and was just another unsuccessful applicant. So heres a big thumbs up to them THUMBS UP! Sizzling Sun and F**king Flies! 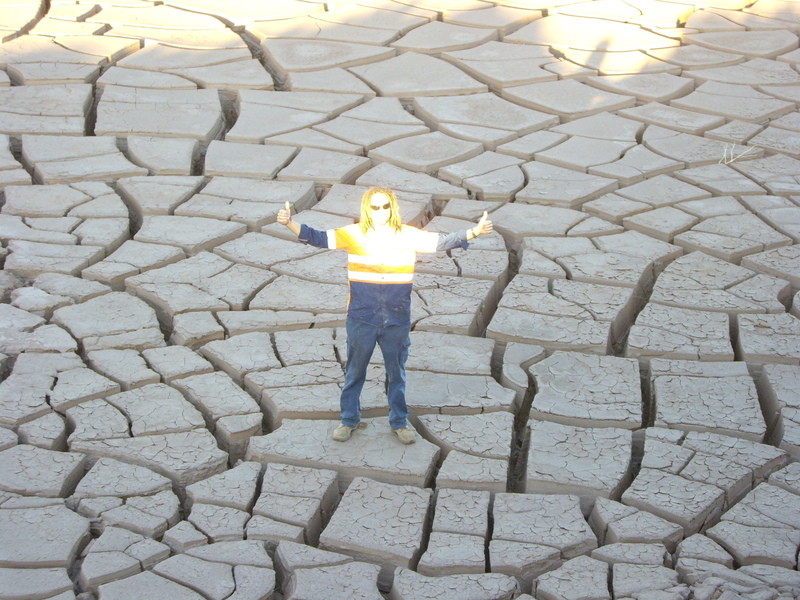 The Ozzie Outback, it really is a harsh environment. Especially coming from little Ol New Zealand, where all the animals are friendly (and yes Ozzies, the sheep are scared – hahaha). Overhere everything wants to eat you or inject poison into you, even the bloody sun wants to kill you. Although this time of year it really is quite beautiful, blue skies welcome you every morning, the flies and rain have gone on holiday, where I don’t know, but they have gone and thats all that is important. But I wrote this post a couple of months back when the flies were abundant and never got around to posting it, so I will continue to moan about them. Luckily for me I am built for the heat, some would say skinny, but I prefer the word, athletic. 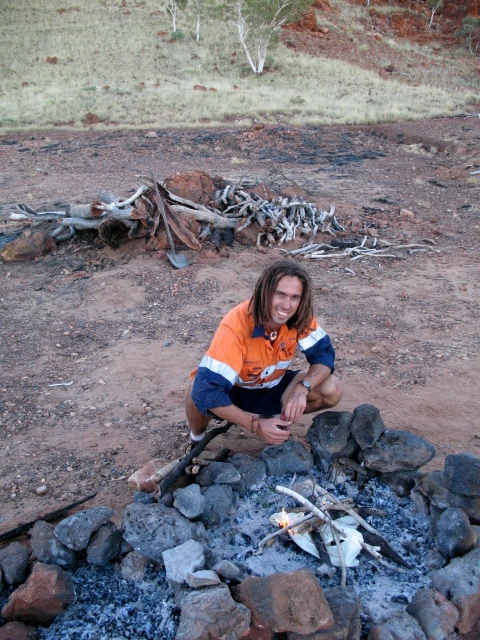 Working in the outback, it is always paramount that you have communication with base camp, but most importantly water! You never go anywhere without water, and all the exploration vehicles are kitted out with 50 litre emergency water tanks. Drinking water becomes a full-time job, a litre an hour is the recommended minimum, so when working a 12 hour day, thats 12 litres of water! And let me tell you, if your not working up a sweat, that can mean a lot of urinating! 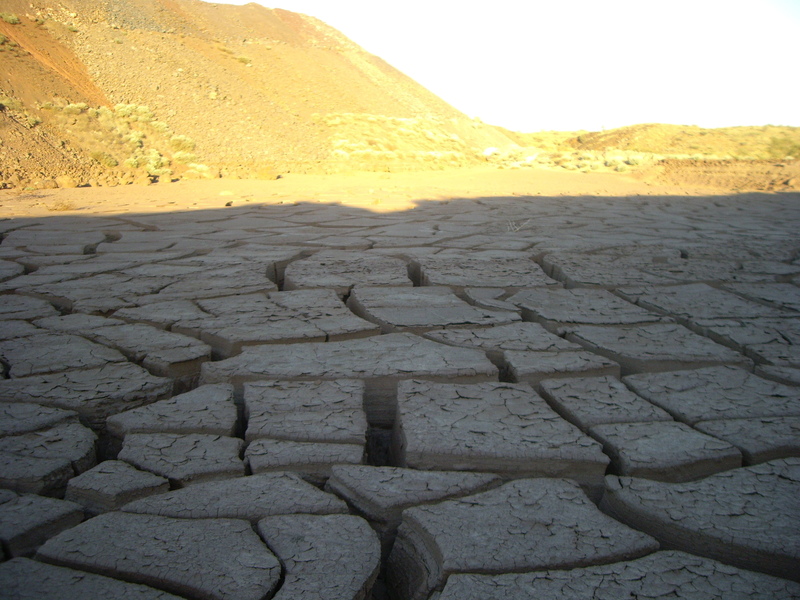 The harsh sun leaves the not only the parched workers baked, but also the land, making it look like that pizza you forgot about in the oven. Just checkout these photos, I got a little artistic and carried away with these but they give a good idea of how aggressive this sun is. Out here in the outback your patience is tested, if things aren’t trying to kill you, they are trying to annoy you. First there is Spinifex, a plant that I have talked about before. Spinifex and facial hair would have a lot in common (well not with my facial hair, the spnifex isn’t patchy). Girls love facial hair, makes a guy look more masculine, but when its there boyfriend that has it, they generally just complain about the itchyness. Same with spinifex, it looks great in a photo, but when you have to walk in it day in and day out, with it pricking you, it fast looses its appeal. And probably the most annoying thing in the outback, Australians! hahaha, just having a go. Flies, my god, just look at the flies in the photos. At first they didn’t bother me, I thought it was mind over matter. But I have crumbled like a recovered alcoholic swallowing his mouthwash instead of spitting it. 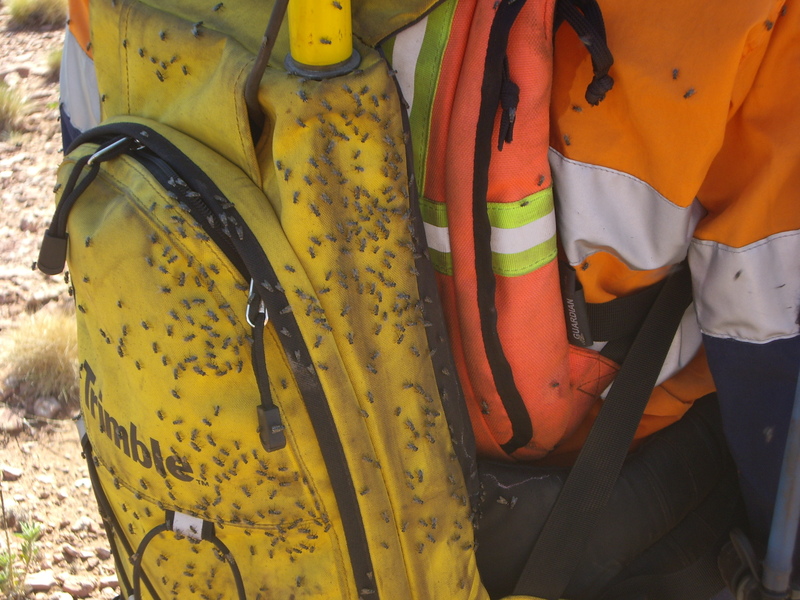 They are annoying, if you do not wear a fly net they have a tendancy to crawl into your eyes. And check out the photo i have of the cut on my leg, yes those 30 odd flies are drinking the blood from my cut like horses at a trough! Dam vermon, maybe they are hatching fly eggs and I’m going to start farting flies! 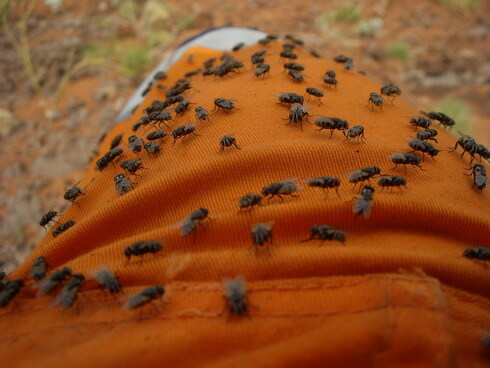 But really, I’m just complaining to be complaining, I love the outback, even those flying little flies, its a unique and beautiful place. I work in a sauna, and some people pay money to go to the sauna or pay extra to exercise in the hot with such gimmicks as “hot” yoga. All I know is that working in the outback is paradise compared to the finger freezing Canadain winters. But I will leave you with a little video to show you how the flies are and give you a little insight into the landscape of the beautiful Pilbara Outback.